"Your life is an occasion, rise to it" the popular phrase goes. I think of Mr. Magorium when I hear it now and his tender advice to Mahoney, who does not want to let go of her dear friend. I love Mr. Magorium because he is so carefree and fun loving. The only thing he takes seriously is his death, and even then, he handles that with a great deal of lightheartedness. I'm not saying we should be insensitive or oblivious to life's expectations. However, I feel all humanity, especially homeschooling parents and children, need to have a healthy measure of optimism and out-of-the-ordinary adventures. We need to rise to the occasion of life and live it, love it, enjoy it. Youth... and life in general... does not last forever. Now we wait.... "No. We breathe. We pulse. We regenerate. Our hearts beat. Our minds create. Our souls ingest. 37 seconds, well used, is a lifetime." May you rise to the occasion of the life God has blessed you with and find joy in teaching your children to do the same! I love this reminder. 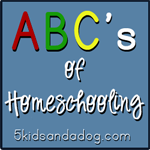 As homeschooling families we have plenty of time to do this, too! Wonderful reminder of the important things in life. Thanks! Beautifully stated! Thanks for linking up!